Traditionally, performance-monitoring tools have been relegated to silos—DBAs have their database profilers, developers and Q&A have their agent-based application instrumentation, and network guys have their packet sniffers and NetFlow analyzers. When an application performance problem arises, development, application support, network, database, virtualization, and storage teams each refer to their own specialist tools. This traditional approach leaves IT organizations in near-constant fire-fighting mode where they're reacting to unforeseen problems instead of anticipating and solving them proactively. The quickening rate of change in IT, sped forward by agile development methodologies and virtualization technology, exacerbates this problem. IT organizations need a unified view that supports proactive application performance management (APM) and greater collaboration among various development and operations teams. Web-based electronic medical records (EMR) provider Practice Fusion, with the number of its users growing by triple digits every year, had the foresight to recognize and prepare for this challenge. "We had many point solutions that provided information about discrete components, but nothing that gave us a holistic, correlated view," explains John Hluboky, VP of Technical Operations at Practice Fusion. "We were looking for a platform that could give us comprehensive visibility and foster greater collaboration across teams." Practice Fusion's web-based EHR system is free to medical providers and supported by contextual ads. For Practice Fusion, the ExtraHop system proved to be the right solution because of its correlated, real-time view of application performance across the network, web, database, and storage tiers. "Every team in our IT organization uses the ExtraHop system. It's our single pane of glass," says Hluboky. "Our system engineers and network engineers use it most often, but the application support team and DBAs also use the ExtraHop system to determine authentication failures or tune a database query, for example. This information is available immediately off the wire in terms that everyone can easily understand." The Software Engineering team at Practice Fusion relies on the ExtraHop system to speed application rollouts with reduced risk. "We set up the ExtraHop system in our staging environment so that the Engineering team can see the impact of new code against our baseline performance," says Hluboky. "With visibility across all tiers of the environment, we can determine whether a performance problem is due to infrastructure, misconfiguration, or possibly a code-level issue. We can see the performance of particular web servers or URLs when using a certain type of transaction, for example. We catch performance issues earlier in the development cycle this way and also monitor the impact of new code releases the next day when users start logging in." 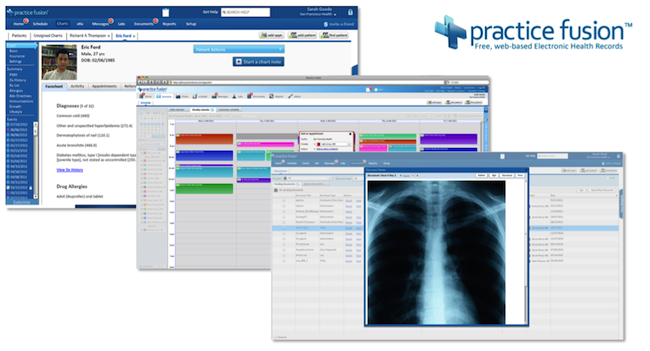 Practice Fusion uses ExtraHop to deliver industry-leading EMR service. 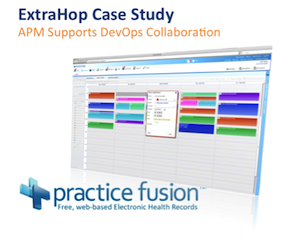 With the ExtraHop system supporting collaboration across teams, Practice Fusion identifies and resolves application performance issues before they impact users. "We've achieved the 'holy grail' of IT Operations where we're not just remediating problems faster, but preventing problems from occurring in the first place," says Hluboky. Web application optimization – An online brokerage uses the ExtraHop system to optimize application response times and is now listed among the top three in industry rankings for that critical metric. Continual service improvement – A leading provider of electronic discovery services uses the ExtraHop system to produce a weekly report distributed across its IT organization that lists tuning and optimization opportunities in the IT environment. SLA management – One of the largest U.S. healthcare systems providers uses the ExtraHop system to track key performance metrics that underlie service-level agreements (SLAs) and is able to proactively fix issues and avoid paying penalties. These types of benefits are only possible with a modern APM solution that provides correlated visibility across tiers and doesn't rely on legacy technology that suits the needs of just one specialist team. When organizations adopt ExtraHop, developers still keep their agent-based tools and profilers for use in preproduction, network engineers still have Wireshark for forensics and NetFlow analyzers for infrastructure monitoring, and DBAs can still run traces if they need to. ExtraHop works differently, providing real-time visibility across tiers and a unified platform that all IT teams can share. This correlated, cross-tier visibility facilitates a collaborative and proactive approach to managing application performance. Read about ExtraHop application performance monitoring solutions for healthcare. Want to try the ExtraHop system for free? Explore our interactive demo.